How will you know if the crib you are buying is on a recall list? Drop side cribs have been banned for 6 years, but people still list them on yard sale websites or sell them at garage sales. Buy your crib new. PHOENIX — They are families who have suffered the ultimate loss, the death of a child, and they are putting their grief into action by sharing a very important safety message that could help save lives. 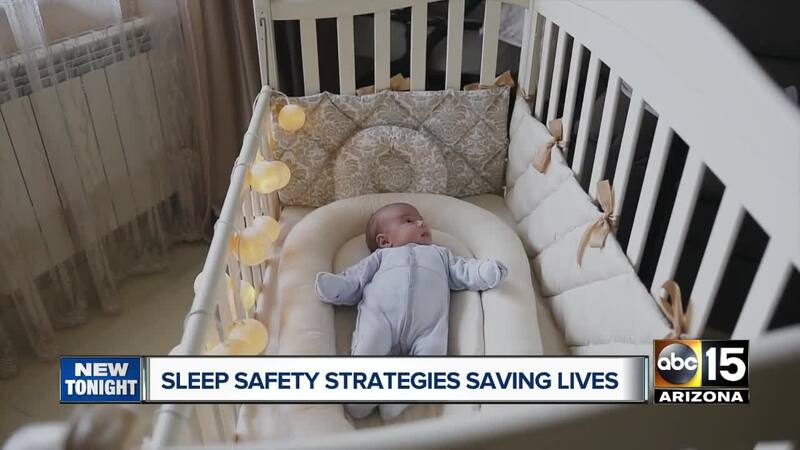 These families have teamed up with the Arizona Department of Child Safety to educate other parents and caregivers about the ABC's of safe sleep. The latest child mortality report released by the state health department shows dozens of babies in Arizona die every year because of unsafe sleeping conditions. Katie and Mark Cosmas lost their baby Taylor Paige Cosmas on April 18th, 2010, at the age of five months. They described Taylor as a healthy baby, full of smiles and laughter. A child who brought so much happiness to everyone around. "It was a beautiful Sunday morning. She went down for her nap; it wasn't abnormal for her to sleep for three hours," said Cosmas. Katie Cosmas said her child died of Sudden Unexpected Infant Death Syndrome or SUIDS, also known as SIDS. Other parents who are sharing their stories described a babysitter putting the child to sleep on his stomach and a little girl who fell asleep in her father's arms and stopped breathing while sleeping. These families are hoping their stories will make other parents and caregivers aware about the importance of putting babies to sleep safely by following the ABC's, which are "always on your back, always in a crib, and always alone," explained Vanessa Bustillos, the statewide prevention coordinator for the Arizona Department of Child Safety. Bustillos had traveled the whole state with her "baby box" sharing tips on safe sleeping environments for babies, and handing out health kits to communities. The agency had banned baby blankets from the box, replacing them with a "sleeping sack" which was a much safer way to put a child to sleep, according to Bustillos. A sleep sack looked like a "onesie" with a little sack where the legs would go. Bustillos said the reason for the change is because blankets could lead to suffocation. The latest reports show 83 babies in Arizona died because of an unsafe sleeping environment in 2017. Bustillos said 99 percent of those deaths could have been prevented. She also added that more than 60 percent of those deaths took place because of co-sleeping, which is when a parent or sibling shares a bed with a baby. "A parent can roll over on a baby, typically what can happen is the blankets, they get lost in the blankets. The blanket could end up on their face, or they can get tangled in the blankets," said Bustillos. Safe sleeping strategies or ABC's always include always putting the baby to sleep alone. The safest place for your baby to sleep is in the same room as the caregiver, but not in the same bed. Parents can always position the baby’s crib next to their bed to easily maintain physical contact and encourage bonding. A baby should always sleep on their back. You can place them on their stomachs to play, but only on their backs to sleep. Your baby should always sleep in a crib or bassinet. To learn more about Arizona's efforts to save babies through the safe sleep campaign, click here.